Your new home is located in a quiet area of Salinas with breathtaking city views. Watch the city be transformed into a magical fairy land as the lights come on at night or step on to the building's rooftop terrace to view the ocean. The condos living room is light and features a dining area as well. The kitchen has nice appliances and looks into the living area...perfect for entertaining. Both bedrooms have great closet space and their own bathrooms. The building features a pool and a rooftop terrace with a jacuzzi. Lounge on the terrace and catch some sun or enjoy the incredible ocean and city views. The terrace also offers a bar, sauna and steam room. 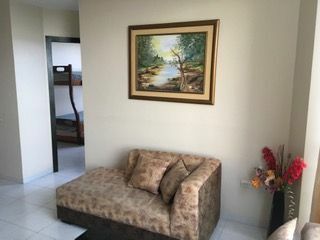 For a private viewing of this exceptionally well priced property, please contact Kimberly at 098.621.2688 in Ecuador or 312.985.7703 internationally. You can also reach her at kimberly@ieiecuador.net.